Donald G Bohning & Associates, Inc. The new Pearl-Knowlton Goodwill site in Strongsville, Ohio contains a building coupled with a large impervious pavement parking lot. This retail location will accommodate an array of used clothes, household items, and furniture to be collected and resold to the public. Local regulations required the new construction project to implement stormwater quantity controls onsite. Several options were considered to address the need for detention by the engineer of record, Donald G Bohning & Associates, Inc. 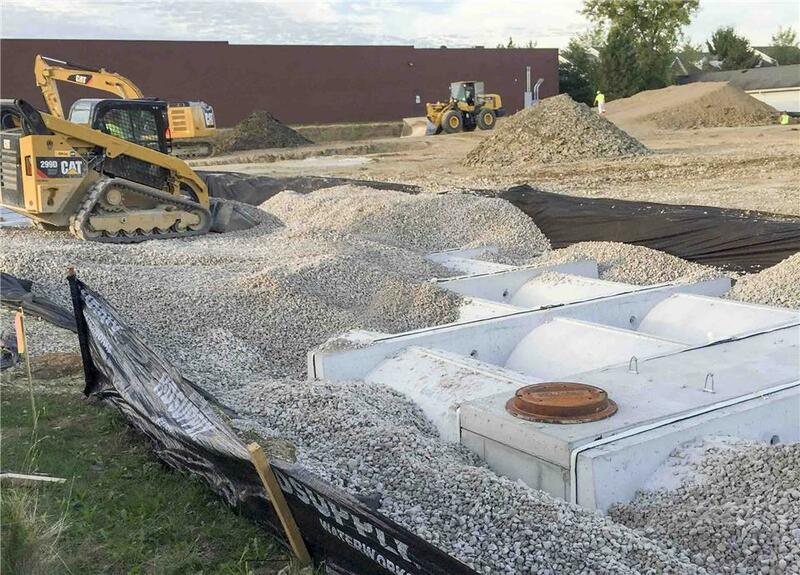 The City of Strongsville has specific detention regulations that do not allow stone void space to be utilized for credit toward detention storage volumes. All required storage volume must be accommodated within the selected system, without accounting for any void space of surrounding stone. This eliminated the option of plastic chambers, as these types of systems rely heavily on surrounding stone void space to achieve their optimal storage volumes. Perforated corrugated metal pipe (CMP) was also evaluated. However, due to heavy traffic volumes and large trucks frequenting the site a rigid design using an HS-25 load-rated system was preferred. Contech’s Terre Arch solution fit the needs of the project. Terre Arch is a modular, multi-chambered, precast concrete stormwater storage system engineered for underground detention. Each Terre Arch unit contains three connected concrete arches with each arch measuring 48 inches in height. The system could handle the needed storage volume while also decreasing the total excavation as Terre Arch only requires 12 inches of cover from top of arch to top of finished grade. Also, under the required height of cover, the concrete is strong enough to handle the needed HS-25 loading requirement. The monetary savings of the Terre Arch system can be realized in the system installation. The system was installed quickly and efficiently. Each Terre Arch section can be set in as little as five to ten minutes. Quick installation and reduced excavation resulted in saving Complete Site Management installation costs and valuable time.